In medium bowl, mix flour and 1/2 teaspoon salt. Cut in shortening, using pastry blender (or pulling 2 table knives through ingredients in opposite directions), until particles are size of small peas. Sprinkle with cold water, 1 tablespoon at a time, tossing with fork until all flour is moistened and pastry almost leaves side of bowl (1 to 2 teaspoons more water can be added if necessary). Heat oven to 425°F. Roll pastry on lightly floured surface, using floured rolling pin, into circle 2 inches larger than upside-down 9-inch quiche dish or glass pie plate. Fold pastry into fourths; place in quiche dish or pie plate. Unfold and ease into dish, pressing firmly against bottom and side. 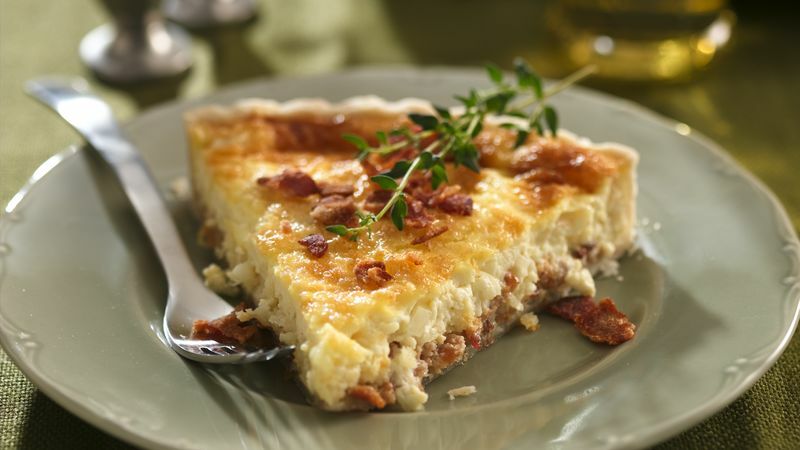 Sprinkle bacon, cheese and onion in pastry-lined quiche dish. In large bowl, beat eggs slightly with fork or wire whisk. Beat in remaining ingredients. Pour into quiche dish. Bake 15 minutes. Reduce oven temperature to 300°F. Bake about 30 minutes longer or until knife inserted in center comes out clean. Sprinkle with additional bacon. Let stand 10 minutes before serving. Seafood Quiche: Substitute 1 cup chopped cooked crabmeat (pat dry), shrimp, seafood sticks (imitation crabmeat) or salmon for the bacon, use green onions and increase salt to 1/2 teaspoon. Divine, divine and divine--this will be the best quiche you've ever tasted! The filling is like liquid satin--it's just so rich and creamy, not at all "eggy tasting," like many recipes can be. To save time, go ahead and use a purchased refrigerated pie crust instead of making it from scratch.